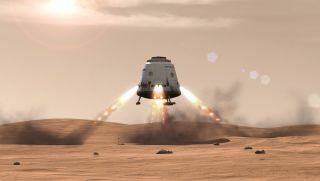 An artist's illustration of a SpaceX Dragon capsule landing on Mars. SpaceX CEO Elon Musk is aiming to build cities on Mars to make humanity a multiplanet species. To help finance the project, SpaceX plans to build satellites and has received $1 billion in investments from Google and Fidelity. Google and Fidelity Investments have invested $1 billion in SpaceX, representatives of the private spaceflight company announced today (Jan. 20). Google and Fidelity now together own about 10 percent of SpaceX, which is run by billionaire entrepreneur Elon Musk. Other SpaceX investors are Founders Fund, Draper Fisher Jurvetson, Valor Equity Partners and Capricorn, company representatives said. On Friday (Jan. 16), Musk announced that SpaceX plans to build and launch 4,000 satellites to low-Earth orbit, in a bid to provide cheap Internet access to people around the world. SpaceX builds Dragon and its Falcon 9 rockets in the Los Angeles area, but the satellite project will be based near Seattle, Musk said. While low-cost Internet access is a significant end in itself, the ever-ambitious Musk also said he wants the satellite program to lead to something bigger. "This is intended to generate a significant amount of revenue and to help fund a city on Mars," Musk said Friday during a speech in Seattle announcing the satellite project. "Looking at the long term, what's needed to create a city on Mars? Well, one thing's for sure: a lot of money. So we need things that will generate a lot of money." Indeed, Musk has said that he founded SpaceX in 2002 primarily to help humanity become a multiplanet species. He aims to get the cost of spaceflight low enough to make a permanent Mars colony economically feasible. Key to lowering the cost of spaceflight is developing fully and rapidly reusable rockets, Musk says, and SpaceX has been working for years to make this happen. Earlier this month, for example, SpaceX tried to land the first stage of its Falcon 9 rocket on an unmanned "spaceport drone ship" in the middle of the Atlantic Ocean just after the rocket had sent the robotic Dragon on its way to the International Space Station on a cargo mission for NASA. The audacious, unpredecented maneuver nearly worked: The rocket stage succeeded in hitting the ship, but landed too hard, resulting in a dramatic, fiery explosion. "Rocket made it to drone spaceport ship, but landed hard. Close, but no cigar this time," Musk tweeted shortly after the launch. "Bodes well for the future tho." It's been a busy news week for Musk, who also heads the electric-car firm Tesla Motors. On Jan. 15, he announced that he plans to build a test track for his potentially revolutionary "Hyperloop" transportation concept in Texas.